Does anybody remember that expression? 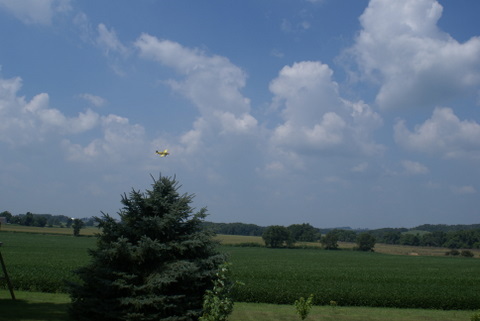 The soybean fields around us (we are surrounded on three sides) were being sprayed today! I only stayed out for a second or 2 in order to take the picture, the boys were mad that I made them come in, but I didn’t think we really needed to be outside while he was spraying. It was especially cool to watch (from inside) when he went low over the field that was directly behind our house. To do the parts that were north and/or south of us, he’d have to pull up right after he got over the field: he was WAY close to our house. I chose to enjoy it, not be freaked out by it…. I snapped this quickly, and dang, look at the color of the sky and the field and stuff. Yummy. 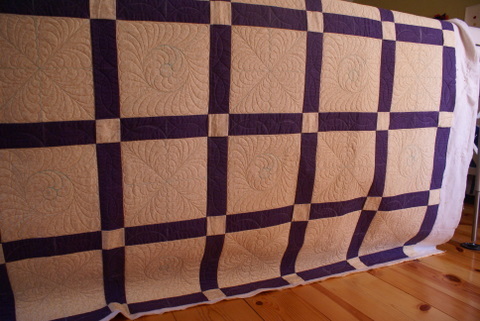 I finally finished quilting this piece a few days ago. I had been claiming that there were 42 blocks when in fact there were only 36. You can still see my blue pen marks that I used as the guidelines for the freehand feathers. I was given free reign, and I’m going to tell her the design is Hugs and Kisses (XOXOX). I think it turned out quite nicely. I’m not sure why it took me so long. The blocks are only 12 inches. 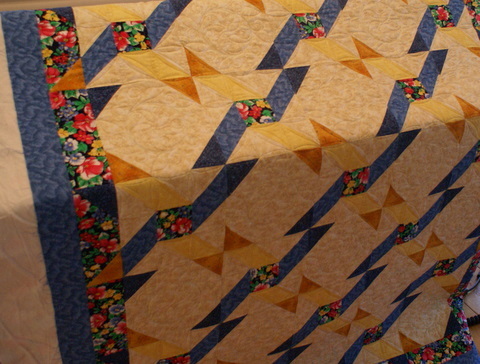 It could be because I’m not used to quilting so much at a stretch — I had to take lots of breaks…. The consensus is that my wildflower is Queen Anne’s Lace. It does not, however, have the drop of red in the center. At least, not that I could see. I had no idea it is a forerunner to our carrots. I especially enjoyed Jami’s definition of a weed: a weed is a plant out of place. I did have to laugh at the comment about removing it if it were interfering with the more structured gardening space. Structure? What’s that? Our front walkway is planted with things that my DH has moved from other parts of the yard. It’s….definitely not structured. It looks kind of pretty, and has lots of flowering things that flower at different times. We have several varieties of lilies, 2 rosebushes, daisies, black-eyed susans, and…lots of other things that I wish I knew the name of. I’ve probably been told some of them before, but that sort of stuff doesn’t seem to want to stick in my brain. On the way to a birthday party this afternoon, I was asking Mark about seed corn and male and female corn plants and…how corns grows…and…he explained it all to me (and right now I remember what he said…) But he’s explained it before, and it obviously didn’t stick the last time. Maybe if I wrote it all out it might implant in my brain more thoroughly? But what would I do wit hthat information? It might take up space that I can’t spare. Speaking of taking up brain space, we are getting ready to go off to have our brains entertained by Ratatouille. I stayed up a little too late last night, and I’m starting to flag. I hope I can stay awake…. Is this Queen Anne’s Lace? We have a couple of these springing up in our front walkway area. Mark said he had cut them out before because he thought they were a weed, but let them go this year because….he just did. Driving home from grocery shopping last night we noticed that the ditches were full of it. Iowa has a pretty extensive program to seed ditches and roadways with native wildflowers and plants, making us wonder about this. 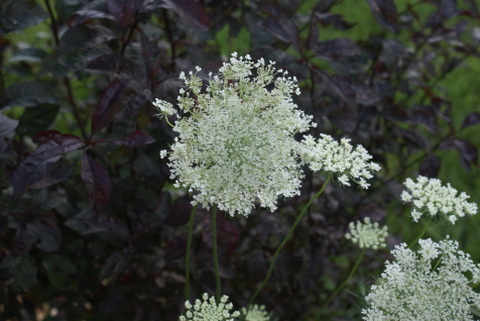 I had a slightly different idea in mind of what Queen Anne’s Lace looks like, but when I visit Wikipedia, my photo appears similar to what they picture. The Wikipedia entry is actually titled Wild Carrot and makes it sound like these are a weed, having been imported from other places. 1. Just received my latest Quilters Newsletter. Everybody who has a copy, please turn to pages 60/61 — the book review section….la di da di da! I haven’t looked at any of the rest of it, but I do notice that they have got a new look, and some new columns. I look forward to a more in-depth read later. 2. Yesterday was a good DHL/UPS day — 2 rolls of batting (the Quilters Dream blend I had ordered), plus an unexpected box of batting — got a free queen-size batt from Fairfield. It’s their new 60/40 cotton/poly blend. Has anyone tried it? I’ll be sure to report as soon as I’ve had a chance to try it out! 3. And I guess I alluded to this the other day, but last week I got the newest Quiltmaker magazine: they had a blurb about blogging, and some of the blogs they visit — and they very kindly included mine in the list! 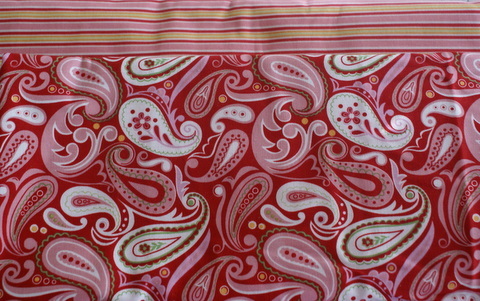 I should probably go look up links to the various companies I’ve just mentioned and include them, but I need to go do some serious contemplation of supper, plus that darned quilt is still calling my name….6 more blocks to go, plus a gazillion rows of sashing…. Couldn’t get that one to upload yesterday. I am sitting here writing this post because I’m trying to avoid finishing the quilt on the frame. 42 large blank blocks, over half are done, but they seem like they are taking forever. 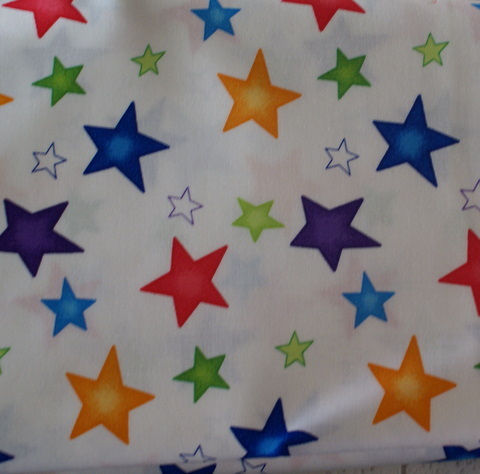 Plus, I have to figure out the sashing and cornerstones yet, too. I’d better go get it finished so I can quilt my crayon box quilt. First: at what age is it that you go from hating to have to go to bed, to recognizing that sleeping is a worthwhile activity that you wish you could do more of? Today at lunch the boys were eating their dreaded carrots and were talking about the things that they hate more than carrots. There were very few. Tacos and Sleeping. They would rather eat carrots than have to eat tacos or go to bed. Mark said he’d offer the boys a choice at bedtime tonight: sleep or a 1 lb bag of carrots. Which do you think they’ll choose? I spent quite a bit of today quilting and sewing. 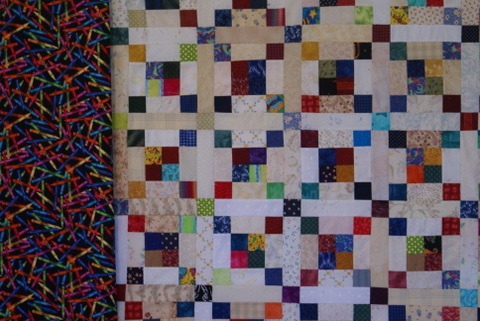 Much progress has been made on the Confetti quilt (which might be changing names, more on that tomorrow…). 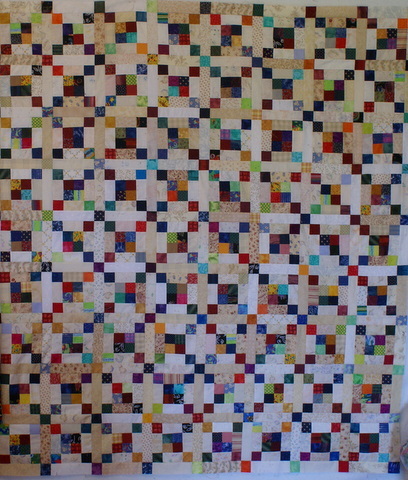 Five more seams and the body of the quilt top will be done. 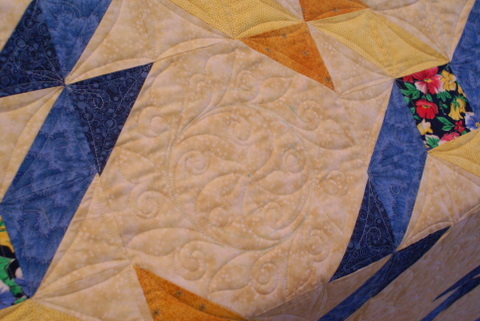 Not sure about borders, considering a pieced checkerboard…. Those big snowball blocks cried out for something more than just me doing a quicky allover, so I did a fairly quicky light custom treatment. You can’t see much of it, and I really should have waited until tomorrow to photograph this in better light, but hey, you get what you pay for here…. I’m trying to upload a detail shot, and my connection keeps timing out. I’ll try again tomorrow. Right now, I’m going to attempt to go to bed early. See, I LOVE to sleep, unlik ethose silly boys of mine….